The Nectar & Bumble subscription box is filled with gorgeous bee-themed goodies for subscribers to enjoy every month. Products range from stationary, candles, beauty products and even edible treats! This week, client services manager, Ruth, reviews this bee-utiful box for us. "Nectar & Bumble's goal is to raise awareness of the sad decline of the bee population around the world and has been created out of the founder, Amber's love and passion for bees. As well as raising awareness, what's great is that products in the subscription box are all sourced from small British businesses, local artisans and brands who also share a love for bees. Plus, even better 10% of Nectar & Bumble's profits go straight to bee conservation charities - so purchasing a subscription is not only a lovely treat for you or a loved one but also a way to do your bit in helping to save the bees! When my box arrived, I was excited to see what was inside - due to the range of products that Nectar & Bumble source, I had no idea what to expect! The exterior of the box was nicely branded with a lovely beehive-inspired design. The contents were beautifully wrapped in tissue paper and bubble wrap, and accompanied with a little card to tell me more about each of the five items. As soon as I opened the box I could smell the beautiful handmade rhubarb and raspberry tea lights from Beefayre, which took me straight back to summer - I can't wait to use these, they smell so good! There was also a jar of delicious Provence lavender honey from a beekeeping organisation, introducing me to an entirely new flavour of honey. Plus, the card included with my box advised that as well as a sweet treat, honey is also a great form of skincare and works as a fantastic face mask, who knew? A beautifully designed notebook, ceramic bumble bee coaster and a very yummy looking cookie were also lovely additions to the box - providing an excellent mix of both collectables and consumables fit for any bee lover! It's clear that so much thought and consideration has gone into the curation of this box, both in terms of the businesses that the products are sourced from, and the blend of products included within each box. I love the idea that as a subscriber each month the collection of bee-themed goodies will be a complete surprise, making it a lovely, mystery treat to come home to every few weeks. 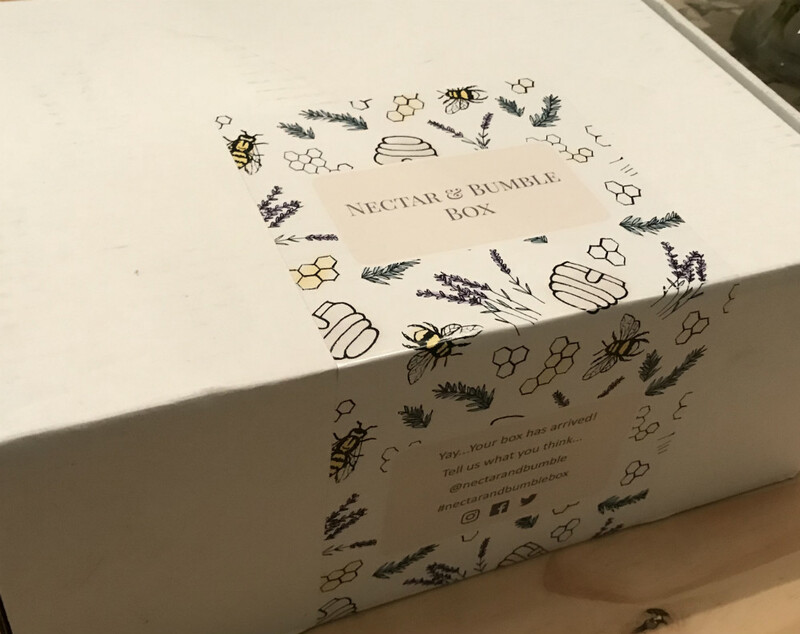 Box subscriptions from Nectar & Bumble start from just £21.67, which is a good saving on the value of the box (the items in my box have a total RRP of £29.95). Plus it's great to know that some of this cost is going straight to charities that are supporting the Bee's cause. All in all, I thought this box was fabulous. I love how the company was born, its ongoing mission, and the notion of receiving a range of carefully selected, locally sourced products each month - it's such a lovely treat. Besides from that, a Nectar & Bumble box would also make for a wonderful gift for a loved one, as it's so beautifully packaged and presented. My best friend is a bee lover, and I know she would love something like this - no prizes for guessing what her Christmas present might be this year. With all that said and done, I'm now looking forward to lighting those candles and settling down with a cup of tea and that delicious looking cookie when I get home tonight!" Look forward to a bee-utiful delivery of bee-themed products each month with a Nectar & Bumble subscription box. Saving bees one subscription box at a time.